It was also the catalyst for starting my own blog, with much encouragement from my family. Because I currently live in France and am an unabashed Francophile, things that are an inherent part of French food culture are often adopted to my eating habits. Some food and drink customs have been more adoptable than others. 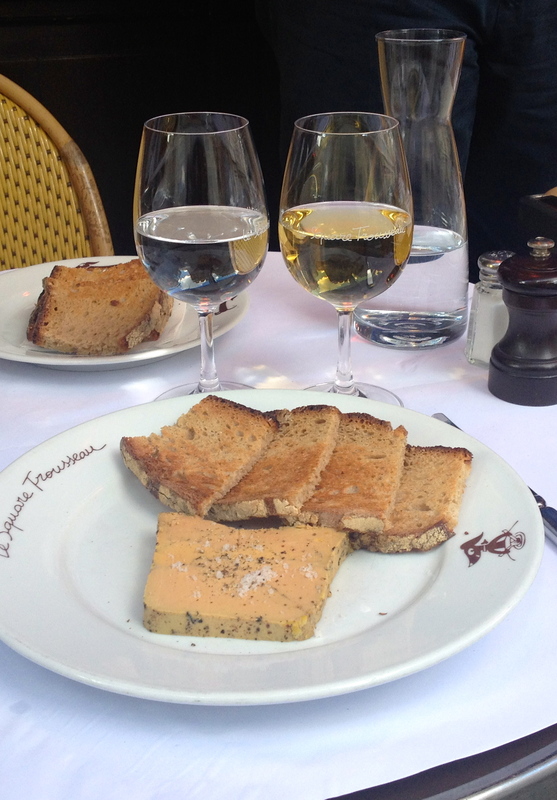 For example, I’ve learned to eat [and adore] foie gras, accompanied by a glass of Monbazillac wine. 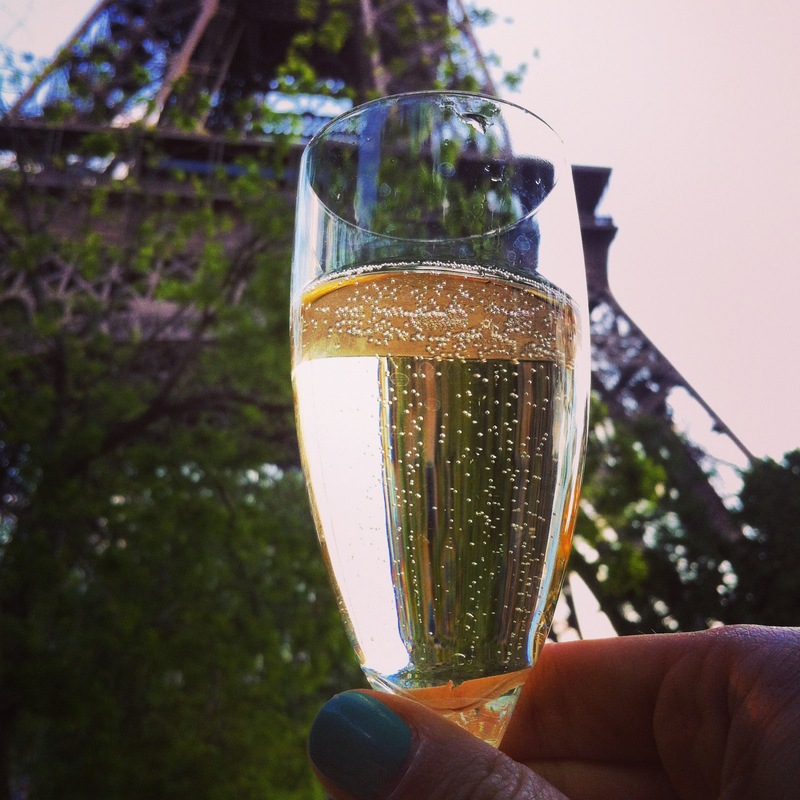 The sweetness of this wine melds perfectly with a slice of foie gras liberally sprinkled with crystals of sea salt. A bite of foie gras spread thinly on toast followed by a sip of this wine transports me to a close-your-eyes-and-enjoy-life kind of moment. For breakfast I slice baguette “cereale”, full of seeds and nutty grains, into segments and then in half lengthwise. Hot from the toaster and smeared with butter from Brittany with chunks of sea salt in it, I’m content and nourished with a pot of strong French press coffee on the side. My dietician daughter says I have a salt dependency, but I truly love the crunch and burst of flavor when I bite into a crystal of buttery salt on good toasted bread. Another local custom, which I took to quite naturally, is enjoying a glass of Champagne as an aperitif and wine with meals. Then there were less successful adaptations. I eat oysters and escargots only occasionally, and beef “tartare” never. In France, raw oysters are served with a sprinkling of high quality wine vinegar and finely diced onions. They are eaten year round, not just in months with an “r” in them. Escargots drowned in garlicky butter and mopped up with torn off pieces of fresh baguette can be pretty delicious, but only when the mood is right. Although many people in restaurants enjoy plates of seasoned raw beef with crispy pommes frites alongside, I can’t get my mind around what the mushy texture might feel like in my mouth. I’ll have my pommes frites with an omelet and salad, thank you.There have been some unexpected surprises. Which brings me to the subject of the leek. 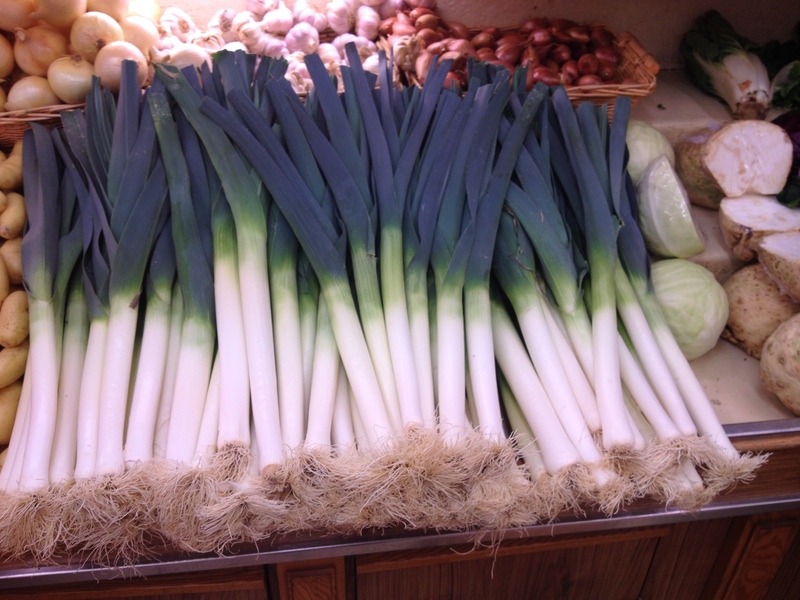 Leeks are prominently displayed in every indoor and outdoor market, with thick green tops and shiny scrubbed white stalks. They are eaten in a myriad of ways here; cooked and marinated as an appetizer, in soups and salads. Leeks are well represented and utilized as a vegetable, but I had never bought or prepared one before we lived in Paris. I was seduced into trying leeks in a rather offbeat way. While reading the book, French Women Don’t Get Fat, I diligently copied the secret recipe that supposedly every French woman turns to when her waistband begins to feel snug, but before things get radically out of control. 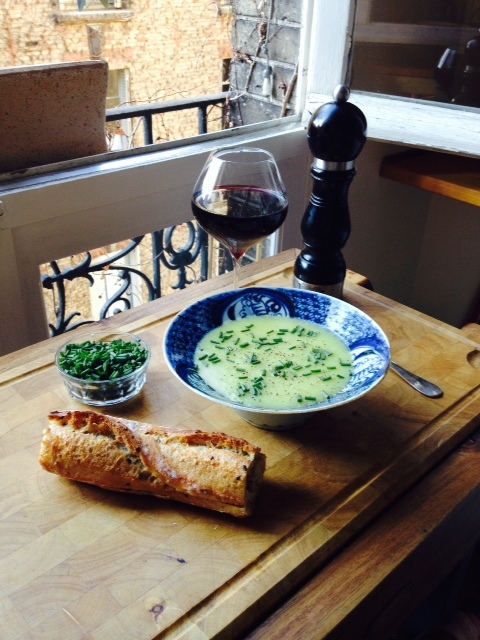 According to author, Mireille Guiliano, French women know to slice up leeks, boil them into broth, sip the soup, and eat boiled leek salad for two days. Thereafter, order is restored to the waistline. On a day when it took several attempts to close the button on my jeans it was clearly time to give this recipe a try. I prepared two pounds of leeks by cutting off the green parts, slicing into one inch pieces and placing them into a large pot of water to which I added some powdered veggie bouillon. [The French recipe does not add anything.] They simmered until soft which didn’t take very long, 15-20 minutes. 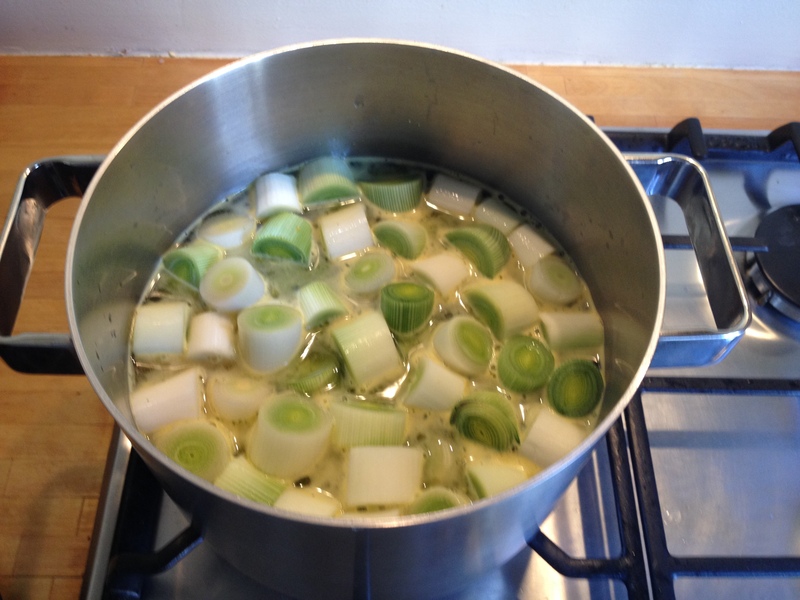 The cooked leeks were separated from the reserved liquid. The plan was to drink broth every two to three hours and eat the remaining leeks drizzled with lemon juice, olive oil, salt and pepper for the next two days. I can do anything for two days. 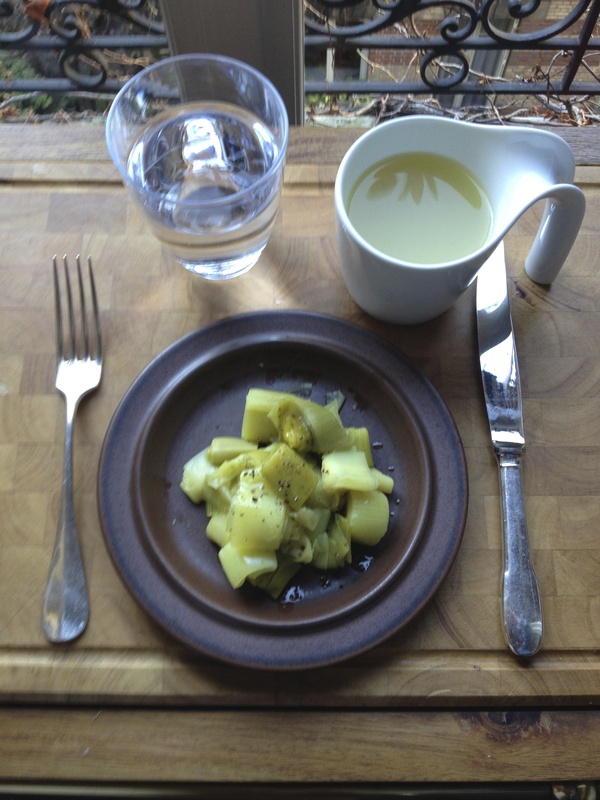 Throughout the day, whenever I was hungry I sipped leek broth from a mug. It was warm and nourishing in a leek-y, onion-y kind of way and the bouillon gave it a little salt kick. 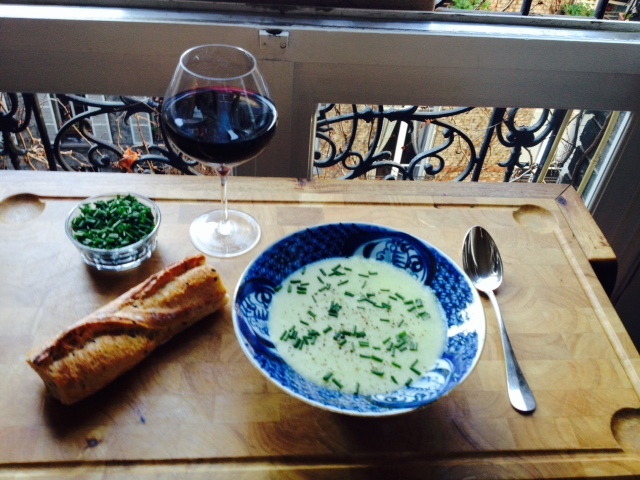 While my husband ate his normal dinner that evening with a glass of wine, I happily consumed cold boiled leeks with lemon juice, salt and pepper and a glass of water just like French women do when their clothes are too tight. By the next morning, I was over it. Looking at the refrigerated leftovers was so grossly unappetizing that yesterday’s waist reducing efforts stayed covered, ignored, and soon to be forgotten. There was little hope except tossing things out when they began to smell. A solution surfaced, as it often does, rather serendipitously. 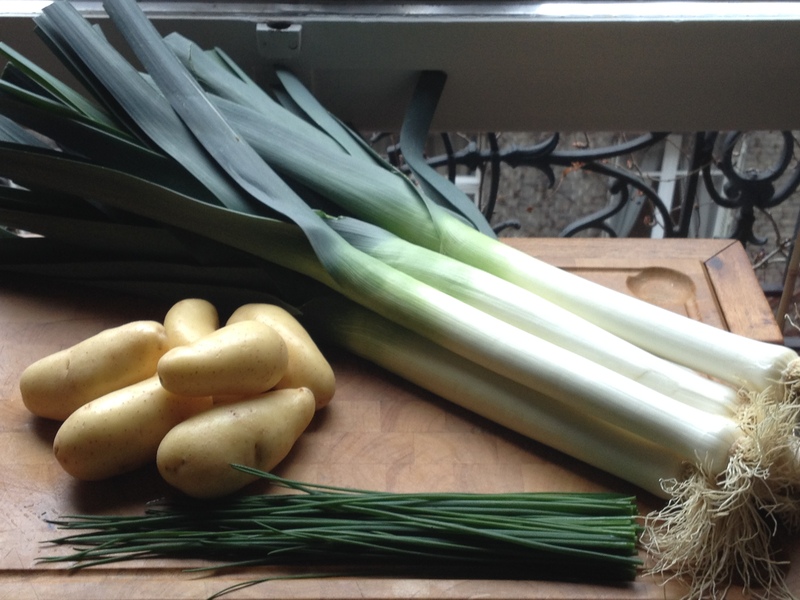 Later in the week while weeding out [a favorite family activity] some old papers and magazines, I came across this: 30- minute recipe for Potato-Leek Soup with Chives. Maybe redemption was possible, with a few added ingredients. I simmered three thinly sliced potatoes in the veggie leek broth until tender, sprinkled grated nutmeg over the cooked leeks and pureed everything in the blender. The result, with very little effort, was a velvety textured, fragrant, soulfully nourishing soup, that when garnished with freshly snipped chives and ground pepper was simply and satisfyingly delicious! That night my husband ate three bowls full. And I learned not to judge food by first encounter because the seemingly boring leek can become oh-so-sublime. Heat oil in large pot over med-low heat. Add leeks, cover and cook 5 min. Add nutmeg and cook 1 min. more. Stir in potatoes and broth. Bring to a simmer. Partially cover, reduce heat and cook 10 min. or until potatoes are tender. Purée with an immersion blender. [Or a regular blender]. Serve hot or chilled, sprinkled with chives. Serves 4. Velvety and golden.